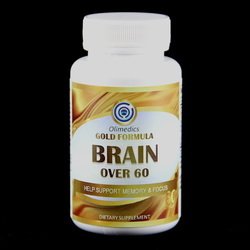 One of our Gold Formula™ products, Brain Over 60™ is the collection of the most advanced nutritional science research, designed to bring you the most extensive benefits to aging brain in convenient capsules. The proprietary blend of ingredients include turmeric, the research proven treasure for aging brain, yet has not been included in any brain supplement other than our Brain Over 60! At Olimedics we are very proud of being the first in supplement industry to provide you this advanced formula. Brain Over 60™ may help support memory, concentration and circulation in the brain. This product is manufactured and packaged in a facility which may also process milk, soy, wheat, egg, peanuts, tree nuts, fish and crustacean shellfish. KEEP OUT OF THE REACH OF CHILDREN. DO NOT USE IF OUTER SEAL IS DAMAGED OR MISSING. STORE IN COOL, DRY PLACE. Active ingredients: Dimethylethanolamine (DMAE), Ginkgo, Vinpocetine, Huperzine A, Glutamine, Carnitine, Phosphatidylserine, and Turmeric.